It’s a good time to own a hotel in Canada, suggests a new hotel investment and operations report from CBRE. The Canadian hotel market remained strong in 2017, buoyed by robust investment and operations performances in Vancouver, Toronto and Montreal, according to CBRE’s 2018 Canadian Hotels Outlook. The strong demand for hotel rooms and for the hotels themselves is expected to continue through 2018, the report said. In 2017, hotel investment volume reached $3.4 billion, including mergers and acquisitions. That number dipped from $4.1 billion in 2016, but taken together, the past two years have been marked by strong merger and acquisition deals and promising tourism numbers — especially in Canada’s three largest cities. “Last year was another year of landmark hotel transactions,” said Bill Stone, the executive vice-president of CBRE’s hotels capital markets group in Canada. 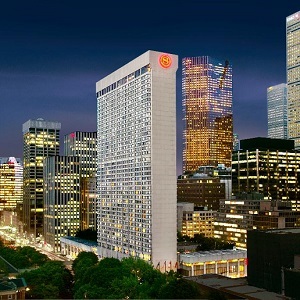 He pointed to the $335-million sale of the Sheraton Centre Toronto Hotel and Hong Kong’s Leadon Investment Inc.’s purchase of bcIMC’s SilverBirch Hotels & Resorts portfolio for $1.1 billion, as two “landmark” deals last year. He said capital is abundant, the economy remains on a modest growth path and developers in Vancouver, Toronto and Montreal continue to build condos instead of hotels — protecting the market from an excess of hotel rooms. “We do anticipate this year will certainly be another active year,” Stone said. On the operations side, profits are up 16 per cent overall across the national market, climbing in 2017 to $14,300 per available room, with B.C. leading the way at $23,600 per available room, the report said. Canadian hotels saw an overall growth in room demand by 4.1 per cent. The market also experienced an increase in revenue per available room (RevPAR) of over eight per cent in 2017, to $102. A major part of the equation is a lack of new supply in key markets. “There is no new supply coming to downtown Vancouver,” said David Larone, the firm’s senior managing director of hotels valuation and advising. Larone said Vancouver and Toronto continue to lead the country in both hotel investment and consumer demand. He said Metro Vancouver operated at 79 per cent occupancy last year and it could creep up to 80 per cent in 2018. He said B.C. will likely reach 72 per cent occupancy for 2018. Ontario will run at 70 per cent, and Quebec at 71 per cent. “Across the country, we’re running 66 per cent occupancy,” he said. “We’ve never hit that number before and we believe we’re going to stay there in 2018 as well,” he said. “When you get into 75 to 80 per cent occupancy in a hotel, let alone across an entire market like Vancouver or Toronto, you’re at practical capacity,” Larone said. The good news comes as Alberta lags behind, but there is hope on the horizon for that market as well, Larone said. He said by the end of the year, Alberta will have captured the demand that’s been lost since 2015 due to economic troubles. But the province’s occupancy numbers will continue to lag other large markets because developers continued to construct hotels started when times were good. Calgary, for instance, will have increased its hotel stock by 20 per cent over 2014 by the end of this year. He said the same can be said of Edmonton, which will be down 12 per cent in occupancy by the end of the year, but mostly (nine per cent) because of additional supply. Save for some kind of black swan event, or a global tourism crisis like SARS, the industry is in a good position to grow. Stone said most big city markets will continue to enjoy strong corporate demand, and tourism growth, stoked by the low Canadian dollar and consistent — albeit modest — economic growth.